At Clean Solutions, LLC, we understand that keeping your office or other commercial space clean is essential. Our janitorial cleaning service in Fort Walton Beach, FL, aims to provide you, your employees, and clients with an excellent and clean atmosphere. From polishing tile and vacuuming the carpet to wiping down countertops and sanitizing toilets, we do it all. 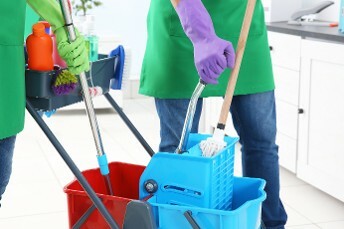 Our office cleaning and janitorial services are provided to commercial clients throughout the area. When you hire professionals like Cleaning Solutions, LLC to handle the commercial cleaning needs of your establishment, you should get a cleaning service that doesn’t leave gaps in your coverage. Our team works hard to provide comprehensive options that ensure your complete peace of mind with one phone call. Our flexibility and customizable commercial cleaning service options allow us to better meet your specific needs. Give your customers confidence in your business and your employees a better place to work with an office professionally cleaned by our capable team. Our services are an investment in the value of your property and your reputation in the local community. People tend to notice which businesses go the extra mile when it comes to cleanliness. With our service, your organization will be well known for maintaining a healthy and productive environment. With extensive experience and top-grade products and equipment, we get the job done quickly and thoroughly, leaving you with premises you can always be proud of. Our background gives us the skills you need, but it’s our client-first attitude that makes us the best cleaning company for you. Contact our office now to set up regular service from our highly trained cleaning team. We proudly serve Fort Walton Beach, Florida, and the surrounding areas. Receive a free professional walkthrough and quote when you request our cleaning services. Clean Solutions, LLC is a local, family-owned-and-operated cleaning company. We provide commercial cleaning services for office buildings, doctor's offices, restaurants, churches, and more in and around Fort Walton Beach, FL. Although we have been in business since 2006, our owners have more than 25 years of experience. They are very hands-on and love what they do. Our company employs only friendly, reliable, and professional cleaners to provide the best results and experience for our clients. Each prospective employee undergoes a thorough background check and receives appropriate screening before joining our team. We build positive relationships by assigning the same cleaner to successive visits with each client, and always maintain open lines of communication to meet your specific needs.